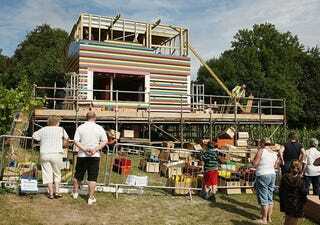 James May's Lego house is looking great. You saw the interior already, but from the outside—sitting on the lustful landscape of the Denbies Wine Estate in Dorking, Surrey—it just looks absolutely bricktastic. As you can see, it's not entirely made of Lego bricks. The frame is made of wood. But that doesn't make it any less stunning. I can't wait to see it finished. This is definitely going to be the biggest Lego model ever built. Until I manage to grab enough bricks to get my dream three floor house in the woods of upstate New York, that is. With a Lego swimming pool.